If the extended hours of darkness are creating problems for you this winter, Ashley-Chicot Electric Cooperative may have the answer to your problem – Automatic Security Lighting. An automatic security light from Ashley-Chicot Electric Cooperative can provide safety and convenience for your home, farm or business. Low cost – You can protect your home and property for as little as $6.21 per month plus a small, one-time connection fee. No additional electrical usage – The monthly rental charge includes all electricity needed to operate the light. Location – The security light will be installed on an existing Ashley-Chicot Electric pole. 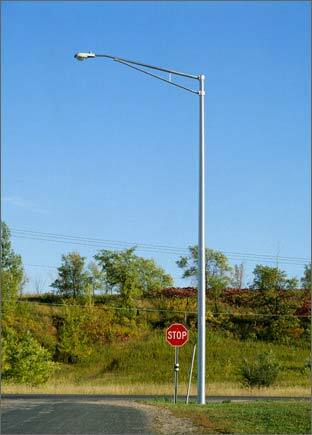 If a pole is added for mounting of a security light, there is an additional pole installation charge. Free bulb replacement and maintenance – No need to wonder how to reach the bulb to change it. Ashley-Chicot Electric personnel will replace bulbs and make all necessary repairs. No light switch to remember – The automatic eye tells the light to come on at dusk and to go off at dawn. Safe and secure – A security light gives you the peace of mind that comes with a bright, dependable light. Consider it a silent sentry watching over your home and property. Any questions you may have call us at 870-853-5212 or 800-281-5212.